Several years ago I blogged about an artist in my 'hood who was helping the cause of peace for free. It was my first Blog Blast for Peace. I’m rerunning it below for a very sad and devastating reason. Mr. de Las Mercedes, a neighbor of mine, saw his home and studio burn to the ground on Tuesday. He lost everything, including all his art. It just so happened that TW had her camera with her to take pictures of the Park Cats. Instead, she wound up taking very disturbing photos of the burnt-out ruin that was the house of our friend, who we’d never met in person. The house is slated for demolition. Photos by TW. She was shooting into the sun. For spectacular pics see nj.com. On his Facebook page, Mr. da Las Mercedes mentions that he’s started a PayPal page for donations to rebuild his and his wife’s lives. Obviously, he’s not taking any orders right now for the Priority Boxes or have any arts available since he doesn’t have a studio. As the old Melanie song goes, "There's a chance peace will come in your life, please buy one." Peace came in my life and it was FREE! Gratis, thanks to an art project by Nicaraguan-born artist Franck de Las Mercedes. This is my very first Blog Blast for Peace, although I've used this platform to write about TW and Pop's involvement with the Peace Movement, going back to their childhood. This post, however, isn't about them. I thought I'd revisit the Peace Box Project aka Priority Box Project, which is still going strong a year after I originally wrote about it. You can read the post in the tab at the top of the page or here. While you're reading, you can listen to songs of peace by clicking on the widget on the sidebar. CK with my Peace Box. "The Priority Boxes Art Series" started in 2006, during the height of the Iraqi war to spark dialogue and challenge people to reconsider their ability to influence change and question the fragility, value and priority given to concepts such as peace. Mr. de Las Mercedes personally paints boxes on the outside, turning them into miniature works of art, addresses them and includes stickers that read "FRAGILE. HANDLE WITH CARE. Contains: Peace" or one of about 20 other words. They're free, to remind us that peace and hope are not only free but also a priority. On his Facebook page, you can see a sampling of some of the close to 10,000 boxes he's mailed out for free to more than 70 countries worldwide. The little kitty's picture is in there too! The first boxes were sent to friends and then he placed an ad on Craig's List, to which he received over 100 responses. Since then, Mr. de Las Mercedes and the Project have received much media coverage and has just celebrated its 5th anniversary. Because of the volume of requests, it can take four to eight weeks to receive a box within the U.S., and up to 10 months outside of it. The series is funded by the artist, contributions and "Handle with Care" T-shirt sales. He hasn't been willing to accept a sponsorship that would brand his boxes. Keeping them free "sends a message that there are some things you can't put a price on, like peace, joy, hope, justice." Peace flyer. Click to biggify. On the left is a sample of the Peace Flyers Project, which was launched in January. 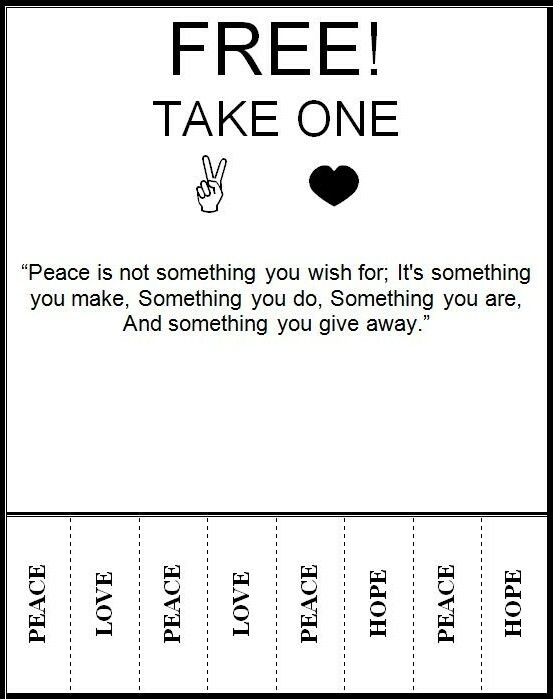 The concept is you can make a difference in your community by printing and posting one or more of these flyers for all to see, and take a symbol of Peace and Hope with them. Mr. de Las Mercedes' art isn't limited to the Priority Box Project. He's an incredibly talented abstract artist in his own right, as you can see from the collage below. To request a "Priority Box," send an e-mail to mybox@peaceboxes.com. Please include your name, address and tell them you read about the boxes on this blog. Only ONE box will be sent per requester/e-mail. No, it's not cool to send for another one from a different e-mail cos that would be something a Republican would do. HAH! Everyone who requests one will definitely get one and Mr. de Las Mercedes would love to see pictures when your box arrives. If you don't like to wait, for a $25 contribution, your 5 x 5 x 5 box will ship within a week of order. 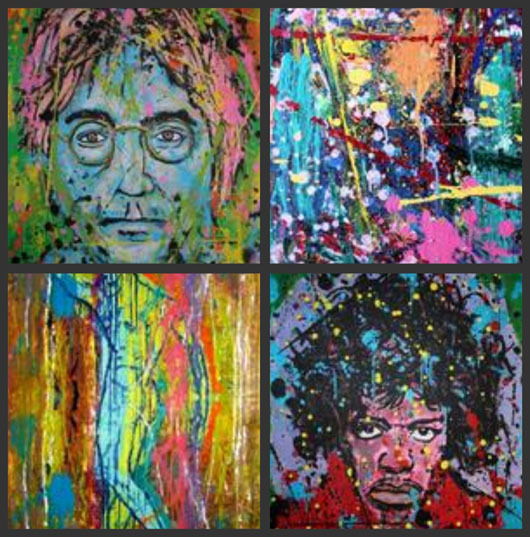 Proceeds help the artist cover the project's costs for shipping and supplies. You can own a work of art for the asking. Art is not solely for the 1%. Now we, the 99%, can also enjoy it, thanks to The Priority Box Project. NOTE: The Priority Box Project has been suspended and there arre NO paintings for sale until Mr. de Las Mercedes finds a new studio and his family’s life returns to normal. Keep them in your prayers. I am very sorry about your Peace loving friend CK. What a wonderful way to share Peace. Fire is very scary. Oh noes. We're so sorry about your friend's home and studio. :( But we are glad he and his wife are okay. I'm so sorry about your friend's home and studio :-( The peace box is wonderful. I hope his and his family's like will go back to normal soon. 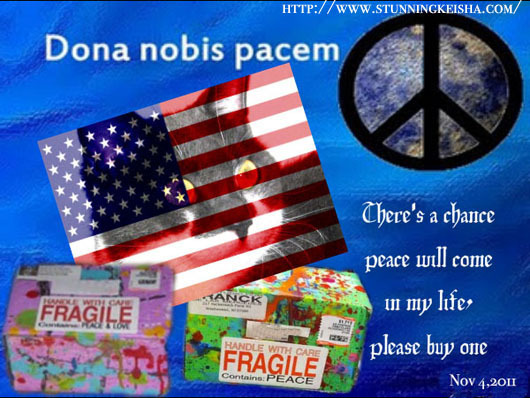 We just recently read your post on the artist's peace boxes. And then a few days later we read about the fire and the loss of all his work. We are sad for him and his wife, but he has helped so many we feel certain many will help him. That is so very sad and we sure hope that nice couple gets the help they so deserve. I remember your post about the boxes and saddened to hear about his devastating loss. I'll share or would it be better to share on FB? oh my goodness...im so sorry for your friend! SO glad they are alright though! How devastating and what a loss. Oh CK, we are so sorry to hear this news. I do remember your blog post and reading about the Artist. What a tragic thing to happen to him. It's bad enough to lose your home, but your place of work and precious art work is just over whelming. How sad for Mr. de Las Mercedes. We purr that he gets the help he needs. That is so scary and sad, CK. We are purring and praying that all the love and help Mr. de Las Mercedes and his family have given to others will come back tenfold to him in this hour of need. OK CK how to we help best? That is incredibly sad....how devastating that would be to lose studio and a lifetime of artwork. We hope the Paypal help works to get this amazing man back on his feet. Why do bad things happen to good peeps? So sorry to hear about the fire. We will share this on Twitter - we have lots more followers. This is so horrible. I have admired his work ever since you brought it to the attention of peace bloggers in 2010. I always meant to request a peace box from him and never did. I know he must be devastated and I hope and pray that others will donate and help them get back on their feet as soon as possible. Prayers and hugs to all of them. He is an amazing human being. Oh no, we are so, so sorry to hear this. 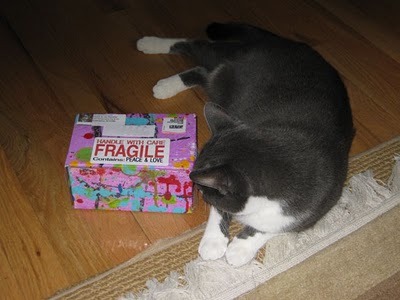 We always admired the peace boxes and his art and we saw it on your blog right when we first came across you, years ago. Will be holding them in our prayers. How sad to hear about your friend CK... I couldn't imagine having to go through something like that. But glad that him and his family are at least safe. We're so very sorry to hear about your friend's devastating loss. What a beautiful Peace post, CK. (((purrs) to your friend...we hope he's able to rebuild his life and continue his wonderful work.